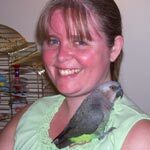 My birds are not clipped anymore ... they were once a year for the first 2 years that we had them. Both Lucy and Jessie depend on me for transport - that's just the way it has turned out. They get lots of time out of their cages - either on top, on the couch with me, on their playstand, etc. My step-son is afraid of the birds, so I don't want them getting into the habit of flying all the time - I have to consider my family as well. Lucy is a curious flyer and will sometimes take flight just because she wants to. If no one is around, I let her get it out of her system. She is a good flyer and I'm not too worried about her hurting herself. No one is home today, so they'll get lots of time out of their cages and I'm sure at some point today Lucy will take flight. Jessie on the other hand only flies when he gets spooked ... so as you can imagine it's more like frantic flying and he usually flies into a window or a wall or hanging off blinds. He's hurt himself a few times ... fortunately not seriously. I don't think Jessie knows what he is missing to be honest. He is such a happy care free bird and makes fun no matter where he is hanging out. I think he is quite happy to come and see me whenever I take him somewhere else in the house. i think that flight is a beautiful amazing thing that is so unique so i love bird flight and when i got skeeter i had no intention of letting him ever be able to fly im not sure really led up to my train of thought to decide he would be a flying bird once his wing feathers grew in. but i wouldnt neccessarily reccomend you not get a parrot if it was never to be clipped it would really depend on the person and very rarely would i ever reccomend getting a parrot however i really do think that parrots should be kept flighted becasue i know that parrots sure didnt ask to be taken out of the nice jungles and rainforests to be our pets i think that they should be able to fly and i disagree with the safety of being clipped because skeeter could have gotten killed once because he was clipped so to restate your question i would reccomend getting a flighted parrot for a responsible home.